These are so much fun! A pair of funky little primative Roothead Decoys. . . Coots, I believe. Necessity being the mother of invention, a block of wood was carved in the shape of the body, and a root was inserted into it to form the head. The root is fastened to the body with a big old rusty nail. A bit of white paint was daubed under the tail and also on the head and finally a lead weight was attached to the bottom. These birds have tie line fastenings on the breast (also daubed with white paint) and most likely these Coot Decoys were used in a larger grouping . . . sort of milling around. Now if you've ever seen a coot swim, you know they are quite active with the head bobbing back and forward as they move, thus the shape of the body would lend itself to a very realistic movement. Also they are quick to go under water when disturbed so the mere fact they are bobbing around would give confidence to other birds and let them know that all is well and safe. The hunter was not trying to attract Coots to shoot but the other species of ducks. If you've ever tasted a Coot or Mudhen you'd never eat another wild duck again. They taste just like a mouthful of seaweedy mud! The structural condition is sound, there are no splits or cracks though the grain of the wood is slightly raised from exposure to the water. The surface of the body has little sparkles in it, most likely from mica from the sand or maybe even perhaps bits of salt from the water. The size is @ 8" long from the end of the bill to the tip of the tail and the tallest is 7-1/2" high. 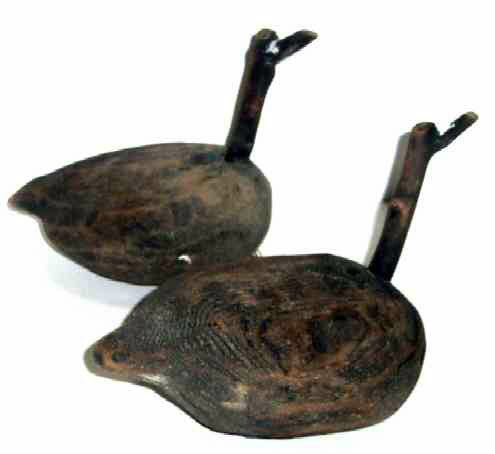 Decoys are perhaps the first example of true American Folk Art and this pair of Coots is a fine example of the genre`. Not sophisticated, but they served the purpose for which they were made and they evoke a sense of playfullness and humor that transcends the years.